Weekly Service Areas – All Sydney CBD and other NSW towns, including Byron Bay, Coffs Harbour, Port Macquarie, Tamworth, Bourke, Dubbo, Orange, Newcastle, Wollongong, Nowra, Goulburn, Wagga Wagga, Griffith, Broken Hill, Casino and all places on-route (7 days per week). If you’re making the move from Sydney and surrounding NSW areas and need trusted movers to handle the transportation of your furniture and other belongings, there’s no better choice than Transcorp Removals & Storage. 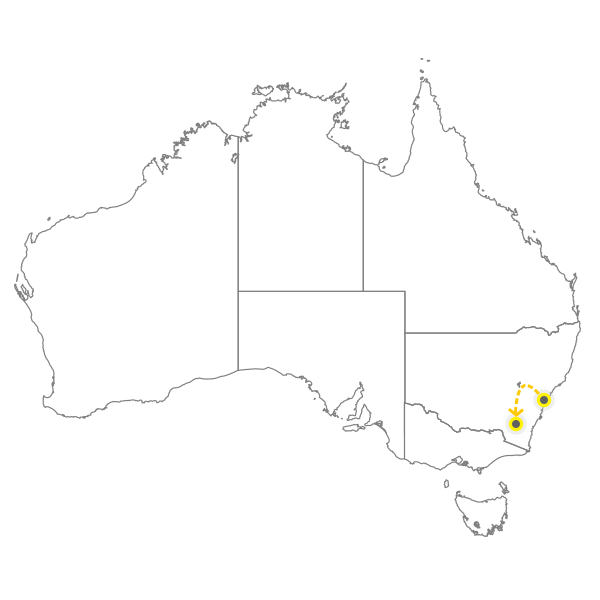 For over 25 years, we’ve helped countless Australians make the move interstate from Sydney. Find out how our interstate removalists in Sydney can help you today. When you choose Transcorp to handle your interstate removals, you’ll benefit from our many years of industry experience and expertise. You can rest assured that our professional removalists have the necessary know-how, equipment and vehicles to provide the very best relocation service. We also handle all items with the greatest care, ensuring your belongings get to their destination in the same condition they left in. If you’re on a tight budget, we offer some of the most competitive rates in the industry. Our movers can also supply you with affordable packaging boxes, materials and supplies that are delivered to your door to help you get everything packed without any hassle. Want to obtain an accurate cost estimation that takes your specific relocation needs into consideration? For more information about our interstate Sydney removalist service, get in touch with our team today by calling us on 1300 466 838. Interstate Removals to or from Sydney – How Long Does It Take? Transit times are based on consolidation of loads (Backloading). Depending on the volume of removals performed, our interstate removalists in Sydney might be able to deliver faster than noted. If your interstate move is urgent, an exclusive vehicle or removal container can be requested to reduce transit time. We may utilise a local removal truck or shuttle van for areas with difficult access. Please notify your sales consultant.